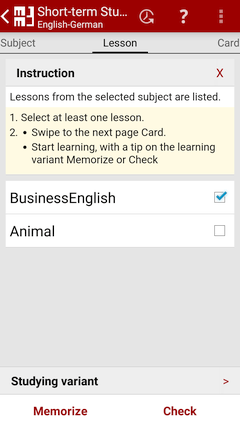 The TeachingMachine is optimized for learning with your Android smartphone, e.g. 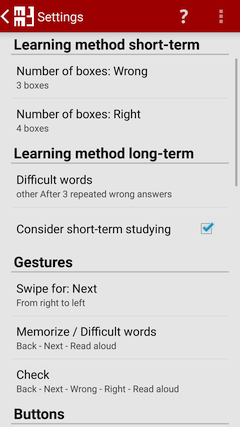 as your mobile vocabulary trainer. You can choose between studying between short-term for an examination or you store the facts permanently into your long-term memory. Only few intuitive inputs for the operation are necessary. In the learning variation for remembering of facts you can completely concentrate upon the learning. The TeachingMachine trains efficiently your learning progress in another learning mode after an optimized system of a studying card index. The TeachingMachine and your mobile smartphone make it possible for you to learn at any place and at any time when and where ever you like whether at home, on the train or during a break. 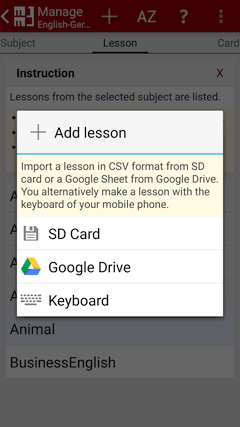 For training you need only your mobile telephone and your lessons in the TeachingMachine. You design your learning process effectively and highly efficient with a minimal time expenditure. You build up your personal knowledge at the same time. Studying consists for the most part of remembering facts. For this the facts must be repeated regularly. 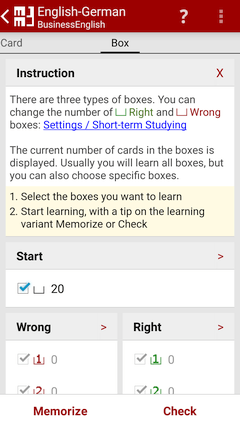 For an effective repetition the studying card index is already used for a long time. 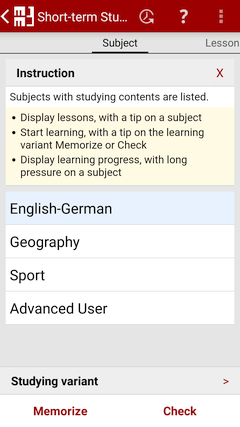 The studying card index as a vocabulary coach is known for learning a foreign language. The principle, however, isn't limited to vocabulary. You can effectively train e.g. historical dates, names of persons, financial figures etc. with index cards. The facts are written in the form of questions&answers on cards. On one side of the card a question is written and on the other the corresponding answer. With the help of several boxes in the studying card index you repeat the facts so often until you remember them. 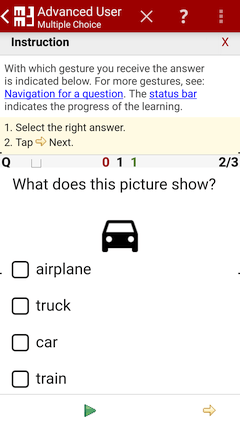 In the TeachingMachine, you can interchange question&answer so that you can check your learning progress in both directions. You can question e.g. a vocabulary as well in the mother tongue as in the foreign language and your learning progress is stored in both directions. 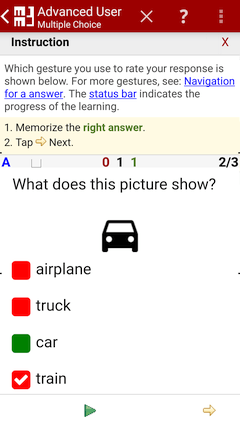 The reversal of question and answer supports your learning process. With the TeachingMachine you train according to the principle of a studying card index according to Sebastian Leitner, but much more efficiently. Your mobile phone guarantees studying at any time and at any place. Questions&answers can often be mixed up. Your learning progress is saved in both directions. Construction of your personal fact archive. You can divide the facts to be learned into several lessons. Furthermore you can summarize several lessons to a subject. Within a subject you can train a lesson but also several lessons at the same time. The number of boxes and their meanings can be defined individually. Facts, which you can remember only with difficulties, you repeat more often. On the other hand, already known facts are queried considerably less. Due to an optimized strategy your studying time is minimized. You can choose between studying short-term for an examination or you store the facts permanently into your long-term memory. 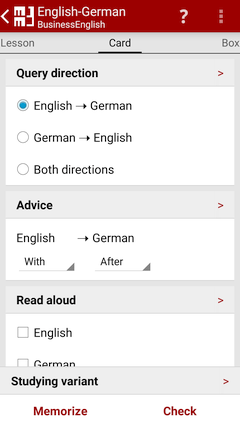 With the language setting "German" of the smartphone the Questions&answers of the naturalisation test are available for German citizenship. With the TeachingMachine you can effectively and efficiently learn your factual knowledge permanently for school and professional life, for the preparation for examinations and vocabulary tests. 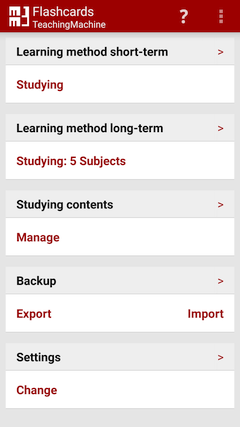 Build up your personal knowledge archive at the same time. 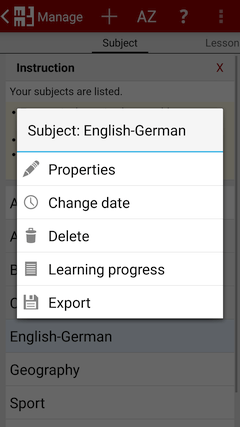 Use the vocabulary builder as your mobile coach. You can use Google Drive™ (Google Docs Spreadsheets) or local the CSV format (Excel) for the import and export of your word lists. You can simply create questions and answers with Excel using your own PC. Dictionaries and flashcards are also offered in the CSV format free of charge on the Internet. We say thank-you for the announcement TeachingMachine - Flashcards / Vocabulary Builder.